I chose this beautiful invite in black for my wedding. The finished product was fantastic and of great quality. I also had and RSVP, wishing well, place card and menu in the matching range. Everything was perfect and exactly what I was hoping for. The service I received was impeccable, Claire made everything so easy and was always there to answer any questions I had. I couldn't have asked for a better experience. I chose this range in navy blue for my 'vintage elegance' wedding. The finished product was of beautiful quality. I had menus printed in the same range in addition to Save the Date cards, RSVP cards and name place cards. The service was great, very helpful and orders were received in a timely manner. This stunning wedding invitation has a classic feel, made modern with its simple use of stark, abstract lines. This gorgeous design uses organic shapes to create a unique lattice effect which is striking and sophisticated. A truly elegant option for a more formal wedding, it's a divine invitation and funky pattern. 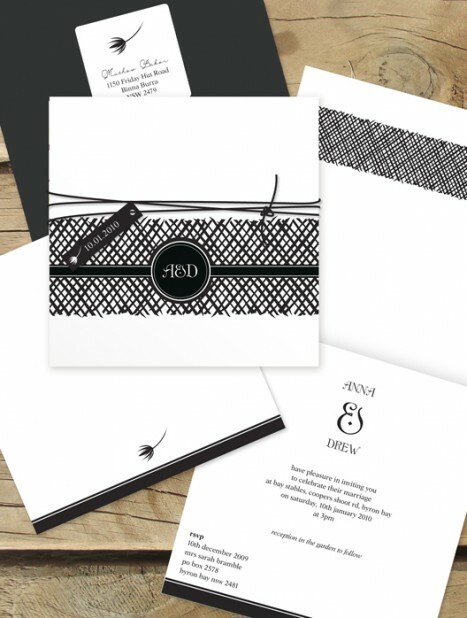 Less is more with this wedding stationery design, this unique style will speak for itself.